Have you just picked up your first selection of crochet patterns for beginners, and found yourself wondering whether it’s written in a foreign language? Don’t despair because you’re not the only one and you definitely won’t be the last. 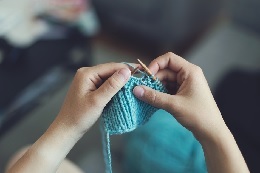 Even the so-called, easy crochet patterns can seem like a complicated code. Once you’ve learned more about them you’ll be wondering what all the fuss was, and appreciate how much easier your crochet projects have become. Crochet patterns use a special kind of shorthand, much the same as knitting patterns. And they are written this way for the same reason. Writing instructions out in longhand English would be very long-winded. And those for complex items would read like a book. Once you get your head around the language of crochet patterns you’ll find them a piece of cake to follow. And that’s why we’re here. To explain what it all means. You’ll also be interested to know that we plan to feature crochet blanket patterns, both for babies and grownups, as well as crochet patterns for hats. So keep us as one of your favorites and have more fun crocheting with us in the future. Most crochet patterns you encounter will have some sort of key at the beginning. So you’d be wise to check this before you start for any unusual, unfamiliar, or nonstandard abbreviations. There will always be an explanation. In every crochet pattern, whether for a beginner or an expert, the directions of each row or round are written using a separate line. Each will be numbered, for example Row 1, Row 2, etc., or Row 1, Row 2, etc. Working in rows means you’ll need to turn your work at the end of each row and work backwards. However, it’s more common to work in rounds, or a continuous spiral. This means you won’t have to worry about turning your work. The end of one round will be indistinguishable from the other stitches in the round. At the end of each row or round of a pattern will be the number of stitches required. These appear in parentheses, or “ “. Using this number is a great way to tell whether you’ve made any mistakes. A section of crochet stitch that needs to be repeated is marked on the pattern by using symbols. They often vary from pattern to pattern, but essentially they mean the same. Some use parentheses, some a set of brackets, or a set of asterisks. Whatever is used they are found before and after the stitches that must be repeated, and will always be followed by the number of times you need to repeat the stitch. When crocheting a garment there are also some special terms, it would be useful to learn. Right front, right sleeve, right shoulder – This term relates to the body part on which the piece will be worn, for example the right arm. The same applies to the left. Right side, wrong side – The right side is the side that can be seen when the garment is being worn. Right-hand or left-hand corner – This is the corner of the piece that is nearest to your right or left hand. You may often be asked to join yarn in a specified corner. At the same time – This means you have to work two different steps at the same time. Work same as left/right piece, reversing shaping – This can be a difficult move for a beginner, as the pattern is leaving the calculation up to you. It’ll be easier to figure out if you use a pen and paper. Sketch out what you did the first time, and basically reverse it for the other piece. Now that you’ve got a basic understanding of the symbols and abbreviations you can break every line down in much the same way. You’re actually ‘decoding’ the pattern into something you can understand. For a full list of abbreviations click here. It’s important to keep practicing and not be disheartened. Before long you’ll be crocheting like a pro. There are hundreds of crochet patterns to choose from, and even the most basic crochet blanket patterns will look scary at first. As with many things practice makes perfect, and this certainly applies to the craft of crochet.